Bioremediation is the use of biological interventions for mitigation of the noxious effects caused by pollutants in the environment including wastewater. It is very useful approach for a variety of applications in the area of environmental protection. It has become an attractive alternative to the conventional cleanup technologies that employ plants and their associated microorganisms to remove, contain, or render harmless environmental contaminants. Three parallel hydroponic treatment systems (each 2 m long × 0.75 m wide × 0.65 m deep) and one control unit were filled with brewery wastewater to an effective depth of 0.5 m. Two sets of floating polystyrene platform were used for each treatment unit to support vetiver tillers for conducting bioremediation study. The wastewater was fed to the hydroponic treatment units at hydraulic loading rate of 10 cm d−1 and hydraulic residence time of 5 days. Influent and effluent samples were collected once a month for 7 months, and analyzed to determine the various parameters relating to the water quality including plant growth and nutrient analyses. Vetiver grass grew and established with well-developed root and shoots in the hydroponics under fluctuations of brewery wastewater loads and showed phytoremedial capacity to remove pollutants. Removal efficiencies for BOD5 and COD were significant (p < 0.05), up to 73% (748–1642 mg l−1 inlet), and up to 58% (835–2602 mg l−1 inlet), respectively. 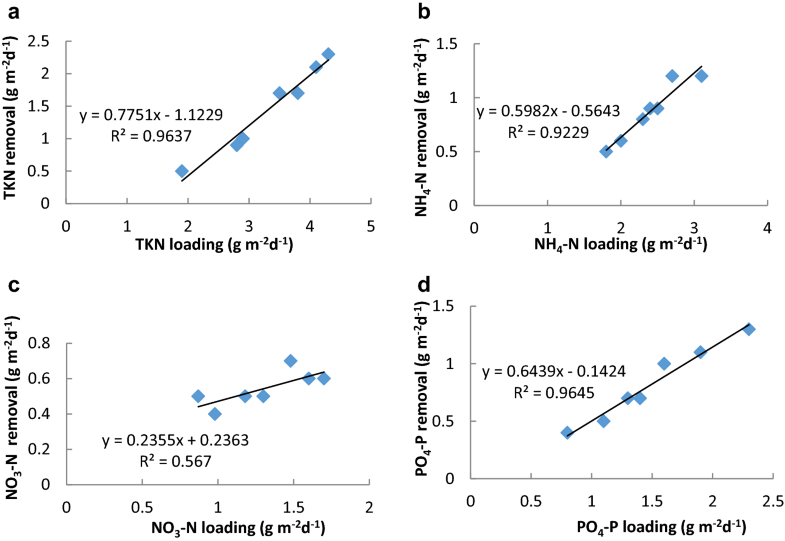 Significant removal efficiencies (p < 0.05) ranged from 26 to 46% (14–21 mg l−1 inlet) for TKN, 28–46% (13–19 mg l−1 inlet) for NH4+-N, 35–58% (4–11 mg l−1 inlet) for NO3−-N, and 42–63% (4–8 mg l−1 inlet) for PO 4 −3 -P were recorded. Nutrient accumulation in the samples harvested were varied between 7.4 and 8.3 g N kg−1 dry weight and 6.4–7.5 g P kg−1 dry weight in the hydroponic treatment units during the study period. 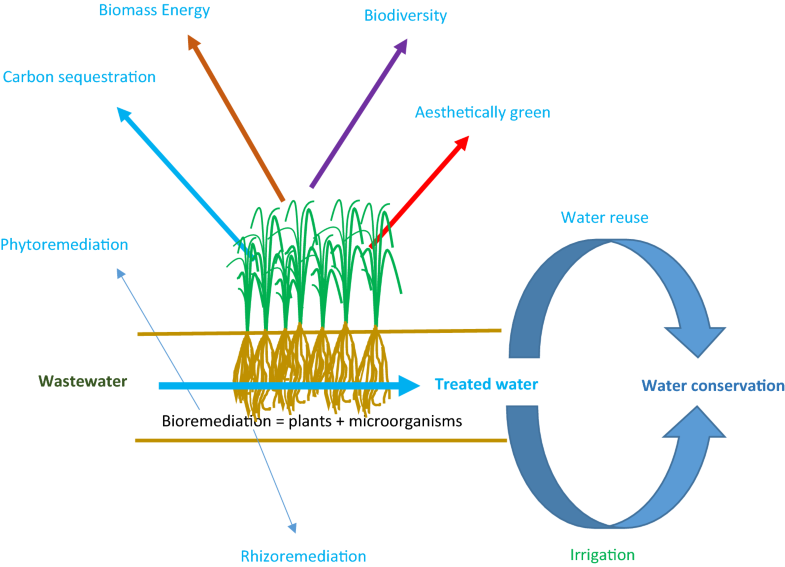 This study has shown suitability of vetiver grass for organics and nutrient removal in the bioremediation of brewery wastewater using hydroponics technique in addition to production of valuable biomass. Bioremediation using hydroponics is green and environmentally sustainable approach that offers promising alternative for wastewater treatment in developing countries including Ethiopia. Clean water is becoming one of the scarce and valuable resources in the twenty-first century. Water quality is mostly affected by the discharges of industrial effluents into surface and ground water sources. Industrial effluents contain inorganic and organic chemicals, biodegradable organic substance, toxic materials, and nutrients. In low-income countries, including Ethiopia, only a small proportion of the wastewater (8%) is being treated (Van Rooijen et al. 2010; WWAP 2017). Many industries discharge into receiving water bodies like rivers, streams, lakes, and wetlands without any treatment, which causes ecological damage and constitutes a public health risk that requires proper industrial waste management to mitigate effects caused by the pollutants. Breweries are a widespread industry with an important economic value in the agro-food sector and brewing is intrinsically a water intensive industry (Alayu and Yirgu 2017). Brewery industry is one of the important industries that cause water pollution. In Ethiopia, water consumption by breweries reportedly ranges from 9 to 22 m3 water/m3 beer, which is far above the accepted international best practice benchmark of 6.5 m3 water/m3 beer (Joshua and Kehinde 2014). This accounts for at least 1.5% of the national consumption of water, impacting on local water services (UNEP 2008). Due to rapid growth of beer consumption in Ethiopia (24% per year) (Nebyou 2011) and the discharge of 70% of the water used by the brewing industry as effluent, the projected expansion of the brewery sector will significantly increase the pressure on the water supply (Olajire 2012; Joshua and Kehinde 2014). Hence, breweries produce a substantial effluent stream, rich in organic matter and nutrients originating from the brewing process (Simate 2015). In spite of significant technological improvements, water consumption, wastewater, solid waste, and by-products and emissions to air remain major environmental challenges for the brewing industry (Fillaudeau et al. 2006; Pettigrew et al. 2015; Alayu and Yirgu 2017). Bioremediation is the use of biological interventions for mitigation of the noxious effects caused by pollutants in the environment. It is very useful approach for a variety of applications in the area of environmental protection. It has become an attractive alternative to the conventional cleanup technologies that employ plants and their associated microorganisms to remove, contain, or render harmless environmental contaminants (Ojoawo et al. 2015). Macrophytes associated with rhizosphere microorganisms have received great attention for their high bioremediation potential in recent years. In general, bioremediation is a process that uses mostly microorganisms and plants to degrade and reduce or detoxify waste products and pollutants. It is cost-effective, aesthetically pleasing, and low-cost suitable solution for many environmental problems. The remediation technique involves specific planting arrangements in a hydroponic system employing floating-plants and numerous other configurations. The method is based on the combination of physical, chemical, and biological treatment processes to remove organic matter, nitrogen, phosphorus, and other substances. The treatment components in the form of vegetation, filter beds, and microorganisms contribute both directly and indirectly for the removal of pollutants from wastewater. Bioremediation of wastewater by hydroponic techniques is recommended as decentralized wastewater treatment and reuse (Haddad et al. 2009; López-Chuken 2012). Hydroponic systems, which utilize plants which are grown in a nutrient solution without soil, are expanding and raising great interest in commercial and scientific community (Papadopoulos et al. 2008; López-Chuken 2012). They are engineered systems designed and constructed to utilize the natural processes involving macrophytes, media, and the associated microbial assemblages to assist in treating wastewaters. This is a relatively new approach in wastewater treatment by which a variety of emergent macrophytes are grown hydroponically on top of floating platform with their roots developing freely into the flowing wastewater (Osem et al. 2007). The roots provide a support medium for attached microbial growth which participates in the treatment process. Yang et al. (2008) reported that the system achieved removal efficiencies of 91, 97, and 71% for nitrate, nitrite, and nitrogen, respectively, and mean removal were 17–47% for chemical oxygen demand, 31–64% for total nitrogen, and 8–15% for total phosphorus for treatment of nitrate-rich agricultural runoff. Vetiver grass is among the macrophytes used in phytoremediation practices. It is a perennial grass that can grow to 2 m high and 3 m deep in the ground. It has a strong dense and vertical root system. Since it is a versatile plant capable of growing in different conditions, it can be effectively employed for bioremediation application (Paz-Alberto and Sigua 2013). Darajeh et al. (2014a) and Roongtanakiat et al. (2007) reported that vetiver has a great potential and effective on-site treatment system for removing nutrients and organics from domestic and industrial wastewaters. The contribution of vetiver grass in the removal process includes: nutrient uptake from the wastewater solution by the root system; release of oxygen by the roots into the root zone (rhizosphere) creates favorable conditions for aerobic decomposition of organic matter and growth of nitrifying bacteria; the root system provides surface area for attached microbial growth which is responsible for microbial degradation processes and the roots exude organic carbon as carbon source for denitrifier bacteria for nitrate removal. Its end-product has several uses including animal fodder, handicraft, and material for organic farming (Alayu and Yirgu 2017). The use of plant roots as a support medium for biofilm formation and attachment in hydroponic wastewater treatment system is less common and the possibility that plant roots may provide unique attachment sites for microbes operating in wastewater treatment has received a little attention (Osem et al. 2007). It is noted that application of bioremediation for wastewater treatment has been expanded, but knowledge of bioremedial potential using hydroponics is still not well exploited, so that it is necessary to better understand for getting more insight into the bioremediation potentials of vetiver grass using hydroponic techniques in the context of Ethiopia. The performance under different environmental conditions imposed by wastewater is not well known. Therefore, there is a need to gain more experience to assess suitability and capacity of the hydroponic system to treat brewery wastewater and integrate the production of plant biomass under the conditions of Ethiopia. The objective of the current study was to assess the bioremediation potential of vetiver grass using hydroponic technique in removing organic matter and nutrient loads from brewery wastewater integrating with its suitability to grow valuable biomass in the tropical climate of Addis Ababa, Ethiopia. The previous studies have used vetiver grass in removing pollutants from wastewater but reported different responses based on the load of the pollutants and climatic conditions (Paz-Alberto and Sigua 2013; Darajeh et al. 2014b). 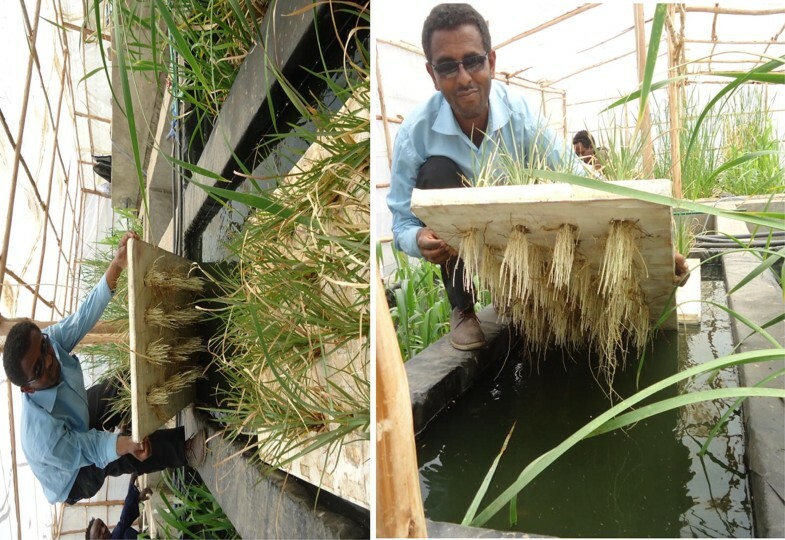 It was, therefore, hypothesized that vetiver grass grown on floating platforms in wastewater can accumulate biomass while effecting extraction of nutrients through its root system under the local conditions in Addis Ababa. The site is located on the premises of Addis Ababa Science and Technology University in Addis Ababa. The city is at an altitude of about 2300 m and the university is located at the city’s southern periphery at 8°58′N 38°47′E. The climate is a subtropical highland climate, with average annual temperature, rainfall, and relative humidity of 15.9 °C, 1089 mm, and 60.7%, respectively. A pilot-scale hydroponic treatment system (HPT) consisting of a primary settling tank (1 m3), a feed tank (1.5 m3), three hydroponic treatment units configured in parallel, and a common effluent holding tank were constructed from concrete. The units were covered by a clear plastic roof, which transmits sufficient light, to prevent dilution effects by precipitation. There was also one control unit without plants to compare the results and study the role of plants in HPT. Triplicated hydroponic treatment units configured in parallel with one control unit were constructed to use advantages of natural processes found in the ecosystem for phytoremediation experimental study of brewery wastewater. It has a 1 m3 common storage and primary settling tanks, and a 1.5 m3 distribution tank in its up inlet part. The units were made of concrete blocks with dimensions (2 m long × 0.75 m wide × 0.65 m deep) and fitted with a polyethylene liner to prevent leakage. The three treatment and one control units were filled with wastewater to an effective depth of 0.5 m by considering the root potential growth of vetiver grass. Two sets of floating polystyrene rafts with a dimension of (0.90 m long × 0.60 m wide × 0.025 m thick) for each replicate hydroponic treatment unit were set up for supporting vetiver tillers on wastewater surface which allowed the vetiver roots to be fully immersed. In each floating platform, 36 small holes with 10 × 10 cm intervals were made. The vetiver clumps were sourced from nearby nursery in Wellisso, Oromiya, Ethiopia. The clumps were split carefully (to avoid damage of the roots) into tillers by hand. The roots of the tillers were washed carefully with tap water to remove adhering soil and sediment prior to use. Similar sized healthy vetiver tillers were selected and then pruned to 20 cm for the shoots (stems and leaves) to reduce transpiration and 10 cm for the roots. Each tiller was planted onto the hole in the platform foam and approximately 10 cm of the roots were submerged under wastewater during the experimental period. After the treatment units were filled with water, the vetiver tillers planted on the floating platform were left to grow 8 weeks to let the system settle to a relatively steady state (Calheiros et al. 2009). Before commencement of the full operation, a serial exposure of raw brewery wastewater feed was introduced into the hydroponic bioreactors. The wastewater was mixed with 75% tap water dilution, gradually increasing wastewater/tap water ratios until only wastewater was added after 4 weeks. During acclimatization period of 3 months (Jamshidi et al. 2014; Valipour et al. 2015), roots of the vetiver plants in the hydroponic units under the planted floating platform were exposed to the available nutrients as the diluted wastewater flowed slowly through the entire treatment unit. Plants grew rapidly after a few weeks. The survival condition was monitored and dead shoots were replaced after 15 days. After the acclimatization period of 3 months, performance tests were started to investigate the suitability of the hydroponic technology using vetiver grass for phytoremediation of brewery wastewater to remove organics and nutrients together with production of biomass. The HPT system had a horizontal and continuous flow mode by receiving the wastewater after primary treatment under different loading rates (owing to the natural variation of the wastewater). The wastewater was adjusted to flow by gravity at 0.5 m-depth level under the planted floating platform. The system was subjected to BOD5 and COD loading rates between 74.8–164.2 gm2d−1 and 83.5–260.2 gm2d−1 per treatment unit. It was operated at a hydraulic loading rate (HLR) of 10 cm d−1 and hydraulic retention time (HRT) of 5 days (Chen et al. 2006), with the corresponding pH and temperature that varied between 4.8–7.80 and 26–40 °C, respectively. The HLR and HRT were based on recommendations for design and intention of the study (Wu et al. 2015). Flow rates (0.15 m3 d−1) were adjusted manually and checked regularly using a measuring cylinder and stopwatch to maintain the HRT. The overall activities of the system were accomplished under a clear horticultural plastic shelter that transmits sufficient sunlight for photosynthesis in a period of 7 months through monthly monitoring of the influent and effluent quality between May and November 2016. Composite samples of untreated wastewater were collected from a manhole placed along a drainpipe that carries wastewater to the existing treatment plant in St. George brewery located at the center of Addis Ababa. Grab wastewater samples were also collected from inlets and outlets of the treatment units on a monthly basis during the study period. Collection, preparation, and physicochemical parametric analyses of all the samples were carried out as per the standard procedures set by American Public Health Association (APHA) (1999). During the entire study period, a total of 52 wastewater samples were analyzed for the required water quality parameters. For the purpose of characterization and performance evaluation, the following parameters were determined based on the standard methods for the examination of water and wastewater (APHA 1999): total suspended solids (TSS Dried at 103–105 °C), total dissolved solids (TDS Dried at 180 °C), total Kjeldahl nitrogen (TKN; Kjeldahl Test), nitrate nitrogen (NO3-N; ultraviolet spectrophotometric screening methods), ammonium nitrogen (NH4-N; distillation methods); phosphates (PO4, Vanadomolybdophosphoric Acid Colorimetric Method), sulfates (SO4; Turbidimetric Method), biological chemical demand (BOD5; 5-day BOD test), chemical oxygen demand (COD; and the Open Reflex Method), pH, and temperature. The samples were prepared and analyzed at the laboratory of Addis Ababa University. Temperature and pH were measured on-site during sample collection using digital thermometer and pH meter. Plant growth parameters such as plant height, number of leaves per plant, and number of shoots added were observed. At the end of the experiment biomass of vetiver grass, samples from each treatment unit at the inlets, at the middle, and at the outlet zones were harvested from the foam platform and transported to the laboratory for analysis. The monitoring period lasted one vegetative cycle of 7 months for performance tests (Kouki et al. 2009). where Cin is inlet concentration and Cout is outlet concentration of the nutrients. The physicochemical characteristics of the brewery wastewater were: BOD5 (667–1505 mg l−1), COD (950–4149 mg l−1), TKN (25–38 mg l−1), NH4-N (15–34 mg l−1), NO3-N (6.83–19 mg l−1), PO43-P (14–30 mg l−1), TSS (2959 mg l−1), TDS (2786 mg l−1), and SO4 (15.33 mg l−1). The average wastewater pH and temperature ranged from 5.4 to 7.0 and 26.0 to 38.0 °C, respectively. The values measured are within the broad ranges reported in the previous similar studies reported by Lemji and Eckstädt (Lemji and Eckstädt 2015). It can be noted that the trends and variability of the values of the physicochemical parameters revealed the fluctuation of brewery wastewater composition. These could be due to various processes that took place in the brewing industry as reported in the United Nations World Water Development Report (WWAP 2017). The analysis of physicochemical characteristic showed that raw brewery wastewater has high levels of organic matter, nutrients, and solids, which corroborates the study by Jaiyeola and Bwapwa (Jaiyeola and Bwapwa 2016). Removal of BOD5 and COD from the hydroponic treatment system was assessed in triplicate units for vetiver grass on the basis of inlet and outlet mean concentrations of the wastewater. The system removed the organics steadily along the course of study in proportion to the influent composition as has been presented in terms of BOD5 and COD removal. Removal of BOD5 up to 73% and COD up to 58% was recorded for the replicate treatment units without any significant change (p > 0.05). Results of the mean composition of wastewater at the inlet and outlets of the control and hydroponic treatment units are presented in Table 1. Average BOD5 and COD inflow concentrations in the wastewater were varied widely from 748 to 1642 mg l−1 and 835 to 2602 mg l−1, respectively, due to the various processes that took place during brewing and related cleaning activities. As shown in Table 1, reductions in BOD5 and COD were recorded in all treatment units. The performance of treatment units with and without vetiver grass was compared for their removal efficiencies based on concentration. ANOVA showed that the outlet values of BOD5 and COD were obviously lower than the inlet values (p < 0.05) during the monitoring period in the treatment system. Removal efficiencies calculated using Eq. (1) showed considerable removal efficiencies for BOD5 (47–73%) and COD (35–58%) under loading rates varied from of 74.8–164.2 g m−2d−1 and 83.5–260.2 g m−2d−1, respectively. These removal efficiencies indicated considerable reductions for the hydroponic units planted with Vetiver grass. Removal efficiency ranges of 13–23% and 9–21% was recorded for BOD5 and COD, respectively, for control units without vetiver grass. The variation in reduction might be attributed to different loading rates due to the nature of the fluctuations of brewery wastewater fed under these experimental conditions. Comparing results of the present with other studies showed that the range of BOD5 and COD reduction was between 15–96% and 10–94%, respectively, in the phytoremediation of palm oil mill effluent using vetiver grass for varying influent concentrations (Darajeh et al. 2014b). The removal efficiencies of the present study are also corroborated by other studies of removal efficiencies for BOD5 (79%) and COD (55%) (Zhang et al. 2014) floating wetland treatment method. Moreover, it was reported that vetiver presented reasonable removal efficiencies 62% for BOD5 (Minh Tran et al. 2015) for domestic wastewater treatment, 80 to 85% for BOD and 85 to 90% of COD (Mathew et al. 2016) for institutional kitchen wastewater treatment. During the entire time series analysis, it was observed that the outlet concentrations of BOD5 and COD of vetiver-planted hydroponic treatment units were lower than that of the unplanted (control) unit. Better organic removal was observed with the planted units than the controls in all the experiments. This clearly shows the beneficial effect of Vetiver in treating the brewery wastewater. For the reduction, the root zone effect is estimated to enhance the growth and activities of the aerobic microorganisms by supplying them with more oxygen from the roots of the plants to decompose the organics, providing root surface for growth and a source of carbon compounds through root exudates (Vymazal 2011). It is expected that the wastewater in the root zone of the hydroponic treatment units undergoes a series of physical, chemical, and biological processes, including sedimentation, filtration, biological degradation, and adsorption (Vipat et al. 2008). Other studies also indicated that the reduction of organics was due to the absorption of pollutants by plant roots and mainly by the associated microorganisms that can break down organic compounds in the process of phytoremediation (Hinchman et al. 1996; Vipat et al. 2008; Vymazal 2010). Among the two organics tested, removal of BOD5 (up to 73%) was better than COD (up to 58%) in all the hydroponic treatment units including controls. The influence of mass loading of organic constituents (BOD5, COD) on their removal rates in the hydroponic wastewater treatment system were evaluated using linear regression. Regression analysis showed a reasonable linear correlation between mass loadings and mass removal of BOD5 and COD (R2 = 0.86 and R2 = 0.63, respectively) (Fig. 1). The removal of BOD5 and COD was proportional to the influent loading. The organic loading (BOD5) inflow of the units varied between 74.8 and 164.2 g m−2d−1, being the mass removal between 51 and 79 g m−2d−1 under the given conditions of the system and with the natural fluctuations of the wastewater composition. The correlation between mass loadings and mass removal for BOD5 is stronger than COD. In terms of COD, the organic loading varied from 83.5 to 260.2 g m−2d−1, with corresponding mass removal between 48 and 104 g m−2d−1. This indicated that the mass removal of organic pollutants by the hydroponic technique using vetiver grass was dependent on input loading rates. Tao et al. (2006) indicated that higher organic loading rates are desirable for increasing microbial production and bacterial activity. Among the operating factors, an organic loading rate of 6.7–15.7 g BOD5 m−2 d−1 is recommended in the manuals by the United States Environment Protection Agency (USEPA) (2000) to achieve 10–30 mg l−1 BOD5 (emission standard) in the treated effluent for other types of wastewater. For these HPT systems, much higher loadings (74.8–164.2 g m−2 d−1) than the recommended was used from the brewery wastewater for testing the system as a stand-alone treatment. Outlet BOD5 and COD ranged from 238 to 873 mg l−1 and 352 to 1686 mg l−1, respectively. The reduction was statistically significant (p < 0.05) based on ANOVA analysis. This result indicated that although the high levels of BOD5 and COD were reduced by over 50%, in the treated effluent, they are beyond the discharge limits set by the national discharge limits (60 mg l−1 for BOD5 and 250 mg l−1 for COD) and international acceptable effluent discharge limits such as EU (25 mg l−1 for BOD5 and 125 mg l−1) for discharge into water bodies or land (EPA 2003; Driessen and Vereijken 2003). Discharge of this effluent into the environment will cause serious pollution problem. Hence, further work is demanded to bring the effluent to the level of effluent discharge limits by optimizing the bioremediation process to reduce the environmental impacts. In general, the reduction of BOD5 and COD is due to phytoremediation process that relies on the synergistic relationships among the macrophyte (vetiver grass), microorganisms, wastewater, and supporting media. Phytoremediation takes advantage of the natural processes of the macrophyte and their roles in pollutant removal. These processes include water and pollutant uptake, metabolism within the macrophytes, and the physical and biochemical impacts of root system. The wastewater composition at the inlets of the hydroponic treatment units (HPTUs) varied with time according to the beer brewing process (Table 1). Figure 2 shows removal of nutrients by the hydroponic system planted with vetiver grass. The analysis of the results showed TKN removal efficiency range from 26 to 54% and 8 to 21% for vetiver grass planted and control units, respectively (for an inlet varying between 19 and 43 mg l−1) (Table 1). Maximum removal efficiency of 54% was recorded for an inlet value of 19.67 mg l−1. The variation in reduction might be attributed to different loading rates due to the nature of the fluctuations of brewery wastewater fed under these experimental conditions. Using ANOVA, significantly (p < 0.001) higher TKN reductions were observed in the HPTUs planted with vetiver grass than in the control in all the experiments. Removal efficiency range of 29–49% was reported for TKN by Boonsong and Chansiri (2007) by vetiver grass cultivated with floating platform technique in domestic wastewater treatment which corroborated the present result. Minh Tran et al. (2015) investigated greater efficiency (64%) for nitrogen removal using vetiver grass in treatment of a mixture of laboratory and domestic wastewaters. As can be seen from Fig. 2a, the changing mass loading rate of TKN varied its removal rates in the hydroponic wastewater treatment system as had been evaluated using linear regression. Regression analysis showed a strong linear correlation between mass loadings and mass removal rates of TKN (R2 = 0.96), indicating that the removal was proportionally changing along with the influent loading. When outflow wastewater of the treatment units was averaged and compared to inflow wastewater, reduction between 28 and 46% was observed for an inlet NH4+-N concentration ranging from 18 to 31 mg l−1 (Table 1). NH4+-N showed a significant decrease in concentration after the wastewater was treated by phytoremediation of the hydroponic technique using vetiver grass. It was noted that the outlet concentration was complying with EPA’s limit values for discharges to water (EPA 2003; Driessen and Vereijken 2003). Removal efficiency range from 6 to 24% was recorded for the control unit without vetiver grass for the same inlet fed, indicating that the concentration of NH4+-N in the treatment units planted with vetiver was lower than the control unit without vetiver. The finding of hydroponic treatment systems using vetiver grass with respect to nitrogen removal in this study was compared with the previous studies. Boonsong and Chansiri (2007) and Zhang et al. (2014) reported average removal efficiency ranging from 13 to 57% for NH4+-N using floating platform vetiver grass for treating domestic wastewater which supported the present result. Average values of removal efficiency 63.5% for nitrogen were also reported using vetiver grass (Minh Tran et al. 2015). Moreover, 41% ammonium nitrogen removal was investigated by Yeboah et al. (2015). It is expected that ammonia in the wastewater is the transformed organic nitrogen by the ammonification process due to the microbial activities. It is further transformed by oxidation to nitrite and then finally to nitrate by nitrification process in the presence of oxygen. The direct uptake by plants contributes to the NH4+-N removal from the wastewater using ammonium as nutrients (Vymazal 2007), which can be stored as organic nitrogen. Biomass assimilation by microbiological processes also adsorbs NH4+-N, further reducing the nitrogen content of wastewater. Regression analysis revealed strong linear correlation (R2 = 0.92) between mass loadings and mass removal rates of NH4-N similar to that of TKN (Fig. 2b). This indicated that removal NH4+-N was dependent on input loading rates. The inlet NO3−-N concentrations given to the hydroponic treatment units varied between 8.7 and 17 mg l−1 during the observation period, with outlet values of 3.67–11 mg l−1 (Table 1). The result shows that the NO3−-N concentration in the waste water was reduced to a notable extent by the treatment with vetiver grass. As it can be seen from Fig. 2c, removal of nitrate fluctuates in connection with the inlet concentration with relatively stable removal efficiency. The analysis of the samples revealed that the removal percentage of NO3−-N ranged from 35 to 58% (Table 2) in loading range of 0.87–1.7 g m−2d−1. The corresponding removal rate ranged from 0.4 to 0.7 g m−2d−1 which is within the range of nitrogen removal rate (0.3–5.8 g m−2d−1) reported by (Hart et al. 2003) using hydroponic vetiver treatment. Figure 2c presents the relationship between loading and removal rate of NO3−-N, and a linear relationship (R2 = 0.57) was observed, but somewhat scattered as compared to TKN and NH4+-N. It was noted that vetiver-planted treatment units have a better efficiency in the removal of NO3−-N compared to unplanted treatment unit (control) (12–29%). The presence of the plant influenced the removal either directly through assimilation (Vymazal 2007) or indirectly through the influence of plants on oxygen and microbial activity in the media (Brisson and Chazarenc 2009). Pollutant removal efficiency differences were statistically significant (p < 0.05) based on ANOVA single factor analysis between planted and unplanted treatment units for NO3−-N. Result showed that NO3−-N reduction is slightly smaller than removal efficiency (73%) reported by Zhang et al. (2014) using floating treatment wetlands. A better nitrogen removal (75–85%) was also investigated using floating systems planted with vetiver for removing nutrients from contaminated water (Akbarzadeh et al. 2015). It is widely accepted that the removal efficiency of the plants may be due to a combination of mechanisms favored by the plants and adsorption of certain nutrients (Norton 2014). Biologically, plants and microorganisms play a major role in the removal of contaminants by transforming and/or accumulating them, and convert them into their own biomass. Microorganisms break down inorganic nitrogen mostly by denitrification which converts nitrate to nitrogen gas, which escapes from the wastewater resulting in the removal of NO3−-N. Plants also contribute to the removal using nitrate as nutrients which can be stored as organic nitrogen. This is because nutrient requirements for the plants must be extracted from the wastewater. NO3−-N concentrations were low in the treatment units, which might be due to anaerobic conditions that were not favorable for nitrification and favorable for denitrification of whatever NO3−-N was produced in these units. The result showed that vetiver was able to reduce the PO 4 −3 -P up to 63% in the loading range of 0.8–2.3 g m−2 d−1 which showed a decrease in concentration after the wastewater was treated by the hydroponic technique. The average outlet concentration was 7 mg l−1 for the observed removal efficiency which was obviously lower than the inlet values (p < 0.05) using ANOVA during the monitoring period (Table 2). However, the outlet concentration remained outside EPA’s effluent discharges standard (EPA 2003; Driessen and Vereijken 2003) after hydroponic treatment. The analysis of the result also showed removal efficiency range from 9 to 19% for the control unit without vetiver grass for the same inlet fed. It was noted that the outlet concentration of PO 4 −3 -P in the experimental units planted with vetiver was lower than the control unit. It is accepted that plant uptake is one of the major phosphorus removal processes in using constructed wetlands (Vymazal 2007) which supported the beneficial effect of vetiver in reducing phosphorus from the brewery wastewater using this hydroponic system. The relation between PO 4 −3 -P loading and removal rates was varied between 8 and 23 mg l−1, which was attributed to the nature of the fluctuations of brewery wastewater fed under the experimental conditions of the present study. Figure 2d presents this relation between loading and removal rates of PO 4 −3 -P during the experimental periods. As can be seen in Fig. 2d, very good linear correlation (R2 = 0.96) was observed between the loading and removal rates. Average PO 4 −3 -P removal efficiency range from 7 to 23% was reported by Boonsong and Chansiri (2008) in treating domestic wastewater using vetiver grass cultivated with floating platform technique. Therefore, the result of this study is good (42–63%), in comparison with the reported results on phosphorus removal. Removal efficiency range of 30–58% was reported by Ayaz and Akça (2001) and Zhang et al. (2014) which is similar to the recorded result of the present study. Gnansounou et al. (2017) reported 45% of phosphorus removal efficiency using Vetiver which also corroborated the present result. A better phosphorus removal (40–75%) was also investigated using floating systems (Vymazal 2007; Akbarzadeh et al. 2015). These indicate the removal efficiency of P by vetiver is higher than that of N. In general, the analysis of the samples revealed that the absorption of the nutrients (TKN, NH4+-N, NO3−-N, and PO 4 −3 -P) was expedited, because vetiver roots had direct exposure to wastewater to be treated. As has been discussed so far, the organics and nutrients were reduced by hydroponics technique with vetiver-planted units and the control unit without vetiver, although the reduction is significant (p < 0.05) by the vetiver-planted units. Vetiver grass contributed for the reduction of BOD5 and COD by providing a suitable habitat for microorganisms in the rhizosphere to decompose organics as they play an indirect role in reducing organic matter from wastewater. The rhizosphere (or root zone) of the hydroponic treatment system is an active reaction zone. In this reaction zone, physicochemical and biological processes take place by interaction of plants, microorganisms, the media, and pollutants. The plants also contribute reduction of nutrients by direct uptake from the wastewater solution. The long-term removal of pollutants from the wastewater can be sustained by periodical harvesting of plant biomass above the floating mat based on age and growing season. The harvested plant biomass can be used as fertilizer, biofuels, and animal fodder. The reasons for slight reduction of pollutants in the control unit without vetiver grass might include sedimentation, oxidation using microorganisms such as bacteria and algae, and anaerobic microbiological conversion. The removal process in the hydroponics control unit without vetiver is similar to removal processes that take place in oxidation ponds. In this study, the influent ranges observed for pH, temperature, and dissolved oxygen (DO) in the treatment units were 4.80–7.80, 26–40 °C, and 0.3–1.4 mg l−1, respectively. These observed ranges of pH and temperature were within the recommended ranges of operating conditions (pH (4–9) and temperature (15–38 °C)) suitable for the performance of macrophytes (Akratos and Tsihrintzis 2007; Shah et al. 2014). The treated wastewater pH and temperature at the outlet ranged from 7.60 to 8.30 and 22 to 24 °C, respectively, both within the permissible limit (EPA 2003; Driessen and Vereijken 2003). The pH became slightly more alkaline after treatment, increasing from 6.4 in the inlet to 7.84 at the outlets of the treatment units. This increase of pH value may be due to microorganisms consuming some organic acids in the bioremediation process. The DO at the inlet was low (mean value 0.83 mg l−1) (Table 2) due to high organic content of the wastewater, which has high levels of oxygen demand. Still lower levels of DO were also recorded at the outlet (mean value 0.52 mg l−1). Vymazal and Kröpfelová (2008) also reported similar result, low inlet DO due to high BOD5 and COD with corresponding low outlet DO in the study of wastewater treatment using CWs. The drop in DO may be due to biological activity in the root zone of the hydroponic treatment units, where DO is a source of energy for root respiration and growth. The other possible source of oxygen required for aerobic removal might be obtained from the atmosphere by diffusion into the vetiver-planted floating platform and by continuous release of oxygen from the plant internal root zones in the rhizosphere (Stottmeister et al. 2003). The changes in growth of the plants as a result of wastewater feed to the hydroponic treatment units at HLR of 10 cm d−1 and HRT of 5 days are presented in Table 2. The number of shoots transplanted was 72 for each treatment unit. By the end of the experiment, there were 69, 72, and 67 plants in replicate hydroponic treatment units HPTU1, HPTU2, and HPTU3, respectively. Survival rate of all vetiver grass tillers on the effluent was 96%. Establishment and growth of vetiver grass were due to provision of nutrients, water, and floating foam from the designed hydroponic system (Mavrogianopoulos et al. 2002). Growth parameters such as shoot length, depth rooting and number of leaves, biomass, and number of tillers per clump were monitored closely and recorded on a monthly basis during the experimentation period. The plant roots grew through the floating foam and into the water below and thereby provide surface area for adsorption and biofilm attachment in addition to assimilating nutrients directly from the wastewater solution (Headley and Tanner 2008). The planted foams had been established and so had shoots extending 0.43–0.92 m above the foam, and well-developed root systems extending up to 0.48 m beneath the foam (Fig. 3). There were increasing trends in depth rooting, length of shoots, number of leaves, and number of tillers with age of the plant. The slight difference in the number of plants among treatment units might be due to health conditions of the individual plants that may affect plant multiplication. Sometimes, wilting of the shoots was also noticed which might be due to variations of responses of individual plant to high level of organic and/or nutrient loading of the influent that can cause stress to the plants (Bindu et al. 2008). Biomass of vetiver grass samples from each treatment unit was harvested from the floating foam and assessed at the end of the experiment. The dry weight (DW) of the harvested plant with about 11 tillers from each unit ranged from 46.52 to 47.46 g DW. The estimated dry weights varied from 2 to 2.28 kg DW m−2 in the hydroponic treatment units (Table 2). Nutrients accumulation in the samples harvested was varied between 7.4–8.3 g N kg−1 DW and 6.4–7.5 g P kg−1 DW in the hydroponic treatment units during the study period. A better nutrient accumulation (14.2 g N kg−1 DW and 12.6 g P kg−1 DW of vetiver) was reported in the literature (Zhao et al. 2012). A pilot-scale study on bioremediation of brewery wastewater by hydroponic technique using Vetiver grass grown on floating platform was conducted. Results indicated that, under hydroponic conditions, vetiver plants with well-developed root and shoots were able to reduce pollutants in the brewery wastewater higher than control unit (without vetiver grass). Seven months’ performance revealed that average removal efficiencies were 47–73% for BOD5, 35–58%, for COD, 26–54%, for TKN, 28–46% for NH4-N, 35–58% for NO3-N, and 42–58% for PO4-P. Morphological parameters such as shoot length, depth rooting and number of leaves, biomass, and number of tillers per clump of vetiver grass were changed positively. The estimated dry weight (DW) of the plant varied from 2 to 2.28 kg DW m−2 in the hydroponic treatment units. Nutrients accumulation in the samples harvested was varied between 7.4–8.3 g N kg−1 DW and 6.4–7.5 g P kg−1 DW in the hydroponic treatment units during the study period. The results demonstrated phytoremedial ability of the vetiver grass in improving wastewater quality. This could solve wastewater problem and, in the meantime, produce biofuels, or other products useful for industry. Thus, bioremediation of brewery wastewater through hydroponic technique using vetiver grass is promising for developing countries including Ethiopia. Removal efficiencies obtained and the observed morphological parameters in this study enable to suggest that further research is still needed for improvement and integration of growing valuable biomass to exploit the promising potential of the proposed system. The first author wrote up the manuscript and conducted experiments in the field. The other authors supervised the experimental site and structured, edited, read, and approved the final manuscript. All authors read and approved the final manuscript. Dr. Ing. Nurelegne Tefera is currently university president and associate professor of chemical engineering in the chemical engineering department. Dr. Helmut Kloos is associate professor of medical geography in University of California, and Dr. Solomon Benor is assistant professor of plant biotechnology in Addis Ababa Science and Technology University. Mr. Abebe Worku is senior lecturer in environmental engineering in Addis Ababa Science and Technology University and senior environmental consultant. The authors thank Ethiopian Institute of Water Resources, Addis Ababa University (AAU) who supervised the financial support provided by the United States Agency for International Development (USAID) under a USAID/HED funded grant in the Africa–US Higher Education Initiative (Grant HED 052-9740-ETH-11-01). The authors are also thankful to the Addis Ababa Science and Technology University for material support and allowing developing the pilot-scale hydroponic treatment system in the campus. We also acknowledge the University of Connecticut for the provision of access to electronic library and St. George brewery for accessing brewery wastewater. This work was supported by the United States Agency for International Development (USAID) under a USAID/HED funded grant in the Africa–US Higher Education Initiative (Grant HED 052-9740-ETH-11-01).